Stachyophorbe (Liebm. ex Mart.) Liebm. Chamaedorea (from Ancient Greek χαμαί (chamai), meaning 'on the ground', and δωρεά (dorea), meaning 'gift', in reference to easily reached fruits, or the plants' low-growing nature) is a genus of 107 species of palms, native to subtropical and tropical regions of the Americas. They are small palms, growing to 0.3–6 m (1 ft 0 in–19 ft 8 in) tall with slender, cane-like stems, growing in the understory in rainforests, and often spreading by means of underground runners, forming clonal colonies. The leaves are pinnate (rarely entire), with one to numerous leaflets. The flowers are produced in inflorescences; they are dioecious, with male and female flowers on separate plants. The fruit is an orange or red drupe 0.5–2 cm diameter. 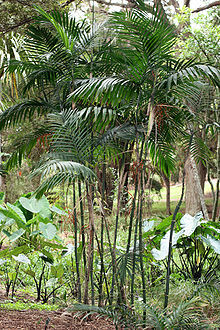 Perhaps the best-known species is Chamaedorea elegans (neanthe bella palm or parlour palm) from Mexico and Guatemala. It is popular as a houseplant, particularly in Victorian houses. Another well-known species is Chamaedorea seifrizii, the bamboo palm or reed palm. Chamaedorea brachypoda Standl. & Steyerm. Chamaedorea carchensis Standl. & Steyerm. Chamaedorea nubium Standl. & Steyerm. Chamaedorea pachecoana Standl. & Steyerm. Chamaedorea piscifolia Hodel, G.Herrera & Casc. Chamaedorea rojasiana Standl. & Steyerm. Chamaedorea skutchii Standl. & Steyerm. Chamaedorea stenocarpa Standl. & Steyerm. Chamaedorea stolonifera H.Wendl. ex Hook.f. Chamaedorea stricta Standl. & Steyerm. Chamaedorea vulgata Standl. & Steyerm. ^ a b "Genus: Chamaedorea Willd". Germplasm Resources Information Network. United States Department of Agriculture. 2007-10-05. Retrieved 2011-04-04. ^ Quattrocchi, Umberto (2000). CRC World Dictionary of Plant Names. Volume I A-C. CRC Press. p. 495. ISBN 978-0-8493-2675-2. ^ "GRIN Species Records of Chamaedorea". Germplasm Resources Information Network. United States Department of Agriculture. Retrieved 2011-04-04. Wikimedia Commons has media related to Chamaedorea. This page was last edited on 11 November 2018, at 22:42 (UTC).